* Parent drop off and pick up. Parents may drop their child off at school as early as 8:30 AM. Pick up is at 3:30 PM. * ICA Van Service. 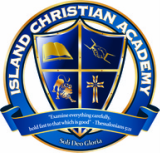 ICA provides a school van service with pickups at Race Road in Coupeville, Greenbank, and Freeland M - F. A fee is charged for this service. * Public School Bus. Students living in the South Whidbey School District may sign up to ride the public school bus. ICA students are accompanied to and from the elementary school bus area by ICA staff members daily.